Alex is one of Australia’s most awarded and widely published animal portrait photographers. Her natural animal handling skills, outstanding images and substantial contribution to improving the lives of rescued animals and endangered wildlife has earned her the reputation as one of Australia’s best and most trusted animal photographers. She is also one of the few professional female photographers worldwide to lead ecologically sound, animal adventure tours to incredible animal destinations. Inspired by the joy of discovery, Alex has traveled to all seven continents. Alex hosts two types of tours: Global Wildlife Tours where she is the sole photography leader and Island Light Tours in collaboration with esteemed landscape photographer Tony Hewitt. In partnership with World Expeditions and the best local tour companies available, Alex leads friendly, all inclusive, small group tours to some of the most extraordinary wildlife locations on Earth. Past tours include Antarctica, Argentina, Christmas Island, Cambodia, India, Sri Lanka, Vietnam, the Galapagos Islands and into the Amazon Basin in Ecuador. On tour, Alex ensures participants create some of the best images they’ve ever taken by sharing the technical secrets she uses to create her own masterpieces and by working closely with local guides to ensure every photographic opportunity is maximised. Her warm leadership, extensive knowledge and generous individual tuition (as little or as much as you want), helps everyone immerse themselves in the trip of a lifetime. Alex’s global tours are very sought after and tend to book out years in advance. 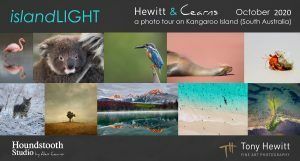 In a recent collaboration, Alex and iconic fine art photographer Tony Hewitt have launched Island Light tours, a series of exclusive, bespoke photographic journeys that embrace the very best environments for landscape and wildlife photography. Island Light tours are designed for photographers of all levels. With more than 550 photography awards between them and 40 years combined expertise, Alex and Tony are considered leaders in their respective fields. On tour, they will generously share their conceptual thought processes, photography workflow and image making techniques. Tony is a ‘Fellow’ of the prestigious Australian Institute of Professional Photography (AIPP), an and Honorary Fellow and ‘Grand Master of Photography’ of the AIPP, and a Fellow of the New Zealand Institute of Professional Photography. His career highlights feature over 300 state, and international photography awards. Tony’s photographic journey has seen him explore the genres of Fine Art Photography, Landscape, Portrait, and Commercial. He has exhibited both within Australia and overseas, and has been invited to judge both nationally and internationally since 1995. With a passion for people, places and pictures, and an instinctive sense of the moment, Tony brings a unique combination of creative skills, award winning photographic vision and simple creativity. Our first Island Light tour is to Kangaroo Island in October 2020. Full information is available here. We are currently taking expressions of interest for future Island Light tours and will provide details as locations are announced.